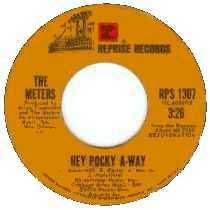 The original recording of this song by The Meters and other recordings by the group use the title Hey Pocky A-Way. The majority of other recordings use the title Hey Pocky Way. The song was written in 1974. It incorporates traditional chants and a drum rhythm that was first used by Meters drummer Zig Modeliste on the Dr. John song Shoo Fly Marches On. The Grateful Dead performed Hey Pocky Way about 30 times between September 1987 and July 1990.The song has also been performed by The Dead and Furthur. Treacherous: A History of the Neville Brothers 1955-1985, The Neville Brothers, 1986?